One of the boldest houseplants around, you can't miss crotons because of their colorful foliage. Often boldly marked with bright yellow, orange, red, and even black, crotons are perfect for adding a tropical touch to indoor decor. They're particularly eye-catching in bright dining rooms and living rooms where their foliage helps energize a room. 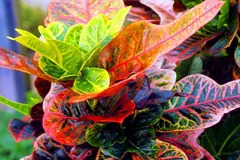 Boost croton's appeal even more by growing yours in a colorful pot that accents the brilliantly colored foliage. 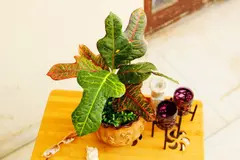 Care Instructions Grow crotons in a bright spot: They like lots of light to produce all those colorful leaves. If your croton doesn't get enough light, you might find the plant grows tall and lanky, with few leaves that don't have deep, rich hues. Water crotons when the soil starts to dry. They're not as thirsty as many other common houseplants, but will drop leaves if they stay too wet or too dry for extended periods. Like most houseplants, they also appreciate abundant humidity. You can boost humidity for your croton by growing it in a well-lit kitchen or bathroom, placing a small humidifier nearby, or grouping it nearby other houseplants. 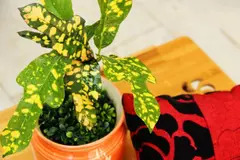 Fertilize croton in spring and summer to keep it healthy and growing. Crotons only need fertilizer once or twice during the season, but you can get them to grow faster by fertilizing more frequently.